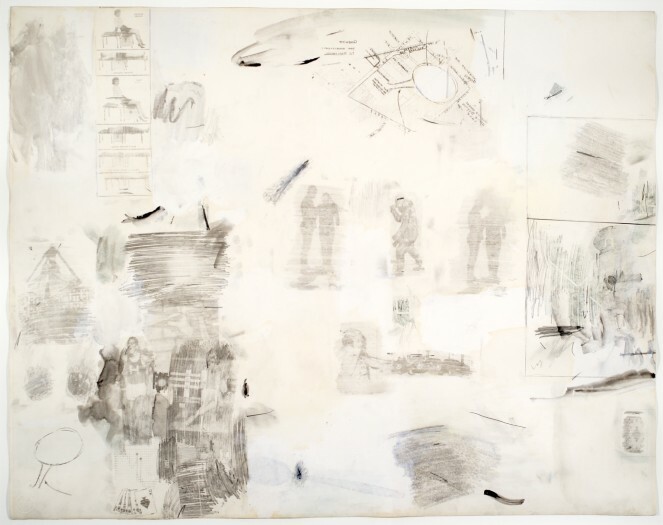 Complete Relaxation dates from the the first year of Robert Rauschenberg's intensive involvement with the transfer drawing process. vertically and the circular diagram at top centre is excised and doubled at some distance, at the lower left corner, just below a pair of jewels. The circle proves to be part of a diagrammatic land map, labelled ‘Acquire for Addition to Division’. destination for post-war artists. Rauschenberg and Jasper Johns visited the area the following summer. They were part of a large group photograph by John Gruen that included artists Larry Rivers and Grace Hartigan on nearby Water Mill beach.